There are technology tools that come along and make your day easier, that make your day better. There are technology tools that integrate themselves so seamlessly into your lessons that you soon forget what life was like before. There are tools that you know you can rely on whenever you need them. And then there are tools that encompass all that and oh so much more. Tools that elevate your teaching ideas to places you never thought they could have gone. That’s how I feel about Skype. 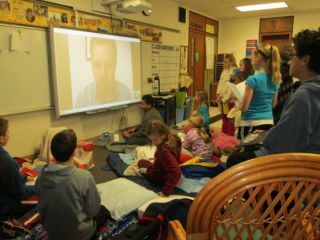 Skype and I have been faithful friends for the past 16 years, ever since I moved to America, but our relationship really deepened 5 years ago when I brought it into the classroom. So why has Skype been such a central piece of my classroom? Because it is free, efficient, easy to use, and opens up a world of possibility that I never could physically bring into my classroom, yet through its power and immense network I can. Skype simply makes what we are doing better. It gives us audiences, authors, experts. It connects us with places around the world and gives my students a way to change the world. So what are some of our best ideas? Pernille Ripp is the creator of Global Read Aloud Project, co-founder of EdCamp MadWI and the author of Empowered Schools, Empowered Students – Creating Connected and Invested Learners and Passionate Learners – Giving Our Classrooms Back to OurStudents, She teaches seventh grade in Verona, Wisconsin, and blogs at http://pernillesripp.com. Follow her on Twitter @PernilleRipp.